Aral Balkan — Introducing the 7th pillar of DiEM25: An Internet of People – a progressive tech policy for a democratic Europe. 22 May, 2017 I’m excited to announce that I’ve been elected to the DiEM25 Advisory Panel to help lead a new initiative with Renata Avila to craft DiEM25’s 7th pillar: a progressive tech policy for a democratic Europe. I’m joining the DiEM25 Advisory Panel to help lead a new initiative with Coordinating Collective member (and good friend and long-time ally) Renata Avila to craft the 7th pillar of DiEM25’s Progressive Agenda for Europe: An Internet of People. Today, we see a Europe in the throes of wholesale capitulation to the digital imperialism of Silicon Valley. 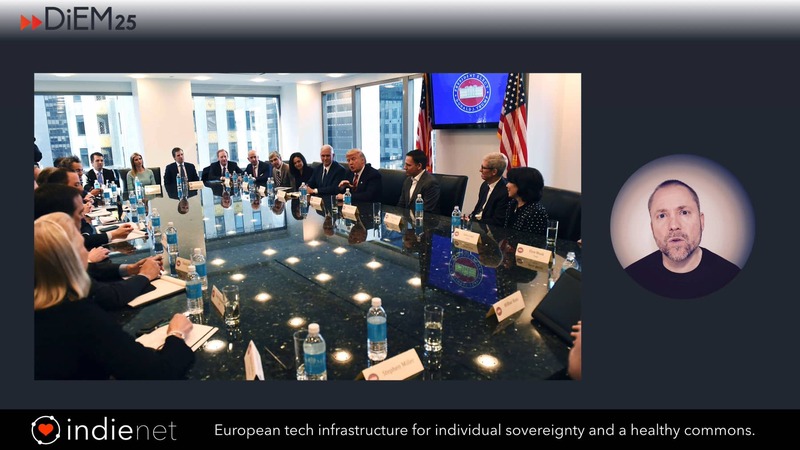 We are worried to observe Europe’s growing dependence on the centralised, surveillance-based technologies of a handful of American platform monopolies that share an intimate relationship with the US government. This state of affairs doesn’t bode well for the individual sovereignty of Europe’s citizens or for the national sovereignty of Europe’s member states. We also see, however, a unique potential in Europe – with its unique history, culture, and approach to human rights – to diverge from this current system of surveillance capitalism and mark its own progressive path ahead. The mission of our initiative is to start a Pan-European process, working together with members of the DiEM25 Network from across Europe, to draft a progressive tech policy for a democratic Europe. Our policy must achieve two important goals. First, in the short term, we must effectively regulate Silicon Valley’s abusive business model in Europe. Second, in the medium-to-long term, we must fund and create an ethical alternative to surveillance capitalism. Imagine an Internet where everyone owns and controls their own space. Our guiding principles in drafting the 7th pillar of the Progressive Agenda For Europe are the Universal Declaration of Human Rights, the Four Freedoms of the Free Software, the Ethical Design Manifesto, the “Share Alike” philosophy of Creative Commons, and a profound respect for – and a desire to protect and encourage – individual sovereignty and a healthy commons as prerequisites for democracy and progressive internationalism. We will take the first steps of drafting the 7th pillar in Berlin this Thursday. In the words of Audre Lorde, “the master’s tools will never dismantle the master’s house”. A democratic Europe and a progressive internationalism cannot be achieved without democratic, progressive technological infrastructure. The Internet of People imagines a decentralised, free and open, interoperable, sustainable, and democratic technology infrastructure for a democratic Europe and beyond. It is our progressive counter-narrative to the exploitative, centralised, and feudalistic mainstream narrative exported by Silicon Valley. Imagine an Internet where everyone owns and controls their own space. Imagine a world where the ability to do this is acknowledged as a basic human right. In such a world, all of your smart devices – the various technological extensions of your self – connect to your own sovereign node (and to each other) instead of to faceless corporations. That is the Internet of People. The Internet of People is an Internet that respects and protects your human rights and the integrity of your self. It is a basic prerequisite for personhood in the digital age. 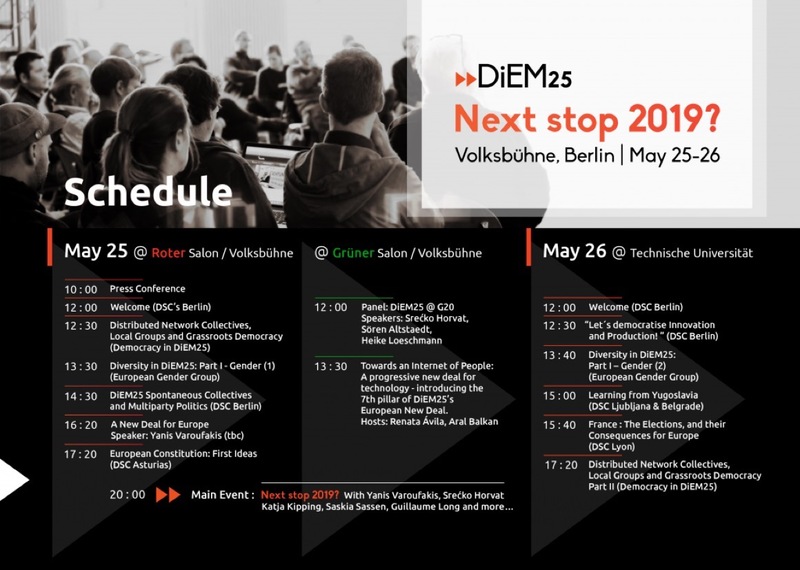 We will take the first steps of drafting the 7th pillar in Berlin this Thursday as DiEM25 meets to answer the important question: How can we take our European New Deal to the ballot box in every corner of Europe, and make it a reality? Renata and I will be holding a 90-minute panel on the 25th to introduce the core philosophy and goals of the 7th pillar. During the first-half of our panel, we will be joined for short presentations by representatives from Free Software Foundation Europe and The Commons Network, Polina Malaja and Sophie Bloemen. The remainder of the panel will be an open round-table discussion with DiEM25 members. In the evening, Renata and I will take to the main stage to introduce the initiative alongside DiEM25 founders Yanis Varoufakis and Srećko Horvat. Renata and I look forward to working together with the DiEM25 Network across Europe and beyond to craft a progressive, democratic, inspiring European vision to counter Silicon Valley’s neoliberal narrative of surveillance capitalism. Here’s to an Internet of People, a democratic Europe, and to progressive internationalism.